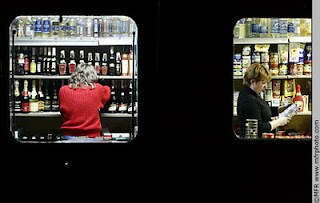 In a liquor and food store converted from an old trailer in Sukachi village, Ukraine, employees restock shelves in the evening, as seen through the trailer windows. I've been on a shooting-through-windows kick recently. Partly I've been playing with layering, and partly it gets dark so damn early now (sunset about 3:45 pm) that much of my street photography has been in the night. Or maybe it says something deep about my feelings of being an outsider, peering in from the outside. If you, like me, don't read Ukrainian, here it is in translation. I am feeling a lot of hope for the future this past week. Since I'm currently free from the constraints of shooting news stories, I've been pushing myself to make some more metaphorical images. Photos that capture an idea rather than a literal truth. So I went looking for some photos to express my newfound optimism. I seldom bother to shoot from a moving vehicle. The rate of success is too low to make it feel worthwhile. 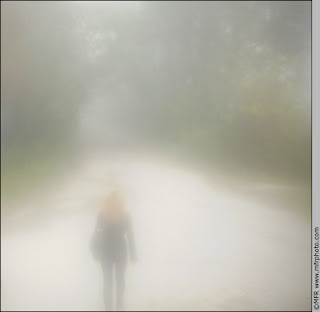 On this morning, however, the fog was so dense and mysterious that I was coaxed into pulling out my camera. When we stopped beside a dirt road in the middle of nowhere I was ready. What, you want a real caption? Okay, fine: A passenger disembarks from a bus on the road from Kyiv to Slavutich, Ukraine, as seen out the bus window on a foggy fall morning. Slavutich is the new city built in Ukraine after the Chernobyl accident to house evacuees from the abandoned Exclusion Zone. Today nearly 4,000 of the 25,000 inhabitants still work at Chernobyl, commuting on 3 special electric trains that depart early each morning and get home after dark. 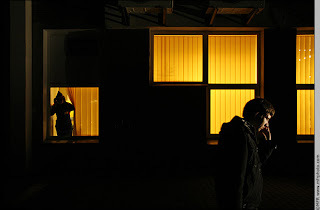 In the evening, the workers walk home from the train station past the main supermarket in town.